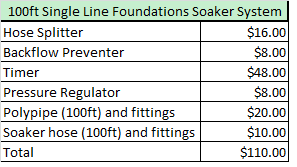 As mentioned in my last post on watering your foundation; Here in North Texas it is essential. Since this is not a one time event but a regular requirement, you might as well look at a relative permanent approach to the solution. I identified two ways to do this last time, one is fairly quick, where the second one is a bit more involved. This is the quick one. Soaker Hose Solution: This is a fairly simple homeowner task but there are some limitations and issues that have to be addressed before you start. Length Limitation: No one single hose shall be more than 100 ft from the source. In other words, if it is 200 feet to circle you house from one outdoor faucet, you will need to either create two systems or split the line from the faucet with one line going clockwise halfway around the house and the other line going the other way. Pressure Regulators: Especially with a porous type soaker hose, high pressure will cause un-equal watering, meaning it will be real wet close to the source and fairly dry at the end of the run. A 10PSI regulator is recommend. Worse case, no more than 30PSI. Elevation: Because there is no way to regulate how much comes out of the pores, placing a hoses down (or up) a slope will cause the hose to over water on the low side. (No more than a 2in rise over 100ft) If this is an issue try cris crossing horizontally to get up the hill. Backflow: Technically required to protect your water system; the backflow preventer, keeps water from seeping back into the pressurized water system. No Kinks: Simply said, do not allow the hose to kink as this will disrupt the flow of water to the system. Building a Soaker Hose System: So now with the limitations understood, you should be able to construct a system without too much of an issue. Here are the major elements of the system. This bill of material is based on a one hose system originating from an exterior water faucet. NOTE: Most of the provided links are from Dripworks.com and MrSoakerhose.com. I have never used them, but their materials appear to be high quality, they have been in business for 20/30 years and they will give you a price cut when buying volume. If you have a bad experience with them, let me know and I will pull the references. Hose Splitter: (not pictured) Since you will probably still want to use the faucet for regular landscape watering, you will need to split water into two sources using a hose splitter. Spend the money and get a good brass unit with individual cutoffs. This will take a lot of abuse as you will keep the water turned on at this point, most all the time. If you are building a multi-hose system, you will need a splitter with more than two outlets. Look at Dripworks at their selection. Avoid the plastic modes as they will only last a season or two. NOTE: if you need to run multiple soaker hoses, you will need a splitter after the regulator as well. 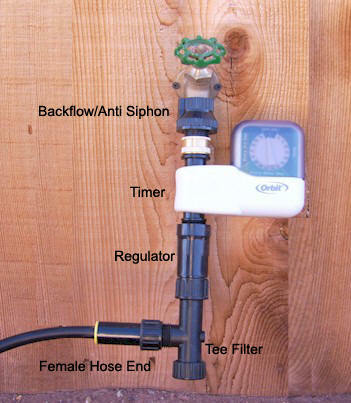 Backflow Device: As mentioned above, these are technically required to keep contaminated water from traveling into the household water system. Timer: A battery operated single timer should meet most of your needs. You will have to monitor the water output initially to make sure you are getting good saturation. If you find pooling water, cut back the water usage. I would start with an hour a day two to three days a week. The water usage should be about 145 gallons per hour for 100 ft of soaker hose at. Using my current water usage rate of .00020 cents per gallon that’s about 3 cents a day. Pressure Regulator: As mentioned above, this is required to promote equal water flow. Filter: (optional) on a system using the porous style of water hose, filtering the water for small particulate is fairly insignificant as you dont have limited holes to release the water. Garden Hose or Polypipe: Depending on where your water source is, you may need a section of water hose to get you to the foundation. Use the shortest length available or make up your own length. If you need to build one, go the polypipe route. You can cut the hose to length and use the polypipe fittings to make up the ends. Make sure the polypipe and fittings are the same dimensions. Since all these connections are on the low pressure side of the system, these fittings are just simple resistance (chinese finger) snap in connectors. So here is what it looks like in dollars. Admittedly, you can probably do this a little cheaper, but I used high quality components, so this should last for years to come. Additionally, you could upgrade to a solar based timer so you wouldn’t have to worry about changing the battery in the timer as often. Next time we will look at the HomeowerBOB foundation watering solution that builds the system off your existing lawns sprinkler system. (See Watering Your Foundation Part III) This is the “Tim the Tool Man Taylor” version and may be a bit extensive, but I have had little to no problems since installation. We will use the existing sprinkler timer, add a new solenoid valve and a different style of distribution hose for more equal disbursement of water. You are currently browsing the Homeownerbob's Blog blog archives for June, 2012.